As UA nears its 150th anniversary, we need you to help us write our story. We’re giving a voice to those who worked, studied and made memories here — from students, faculty and staff to sports fans and concertgoers, the employers of graduates and the vendors of goods and services. Your story will be considered for inclusion in the commemorative coffee-table book and paperback versions that will be published during UA's 150th anniversary celebration in 2020. Submit your memory by Jan. 31, 2019 and receive a digital discount of 15% off for the online UA Alum Store or UA press store. The men's soccer team capped a memorable 2018 campaign, one which saw the Zips earn an NCAA runner-up finish, ranking second nationally across three major postseason polls. The Zips were rated second in the final United Soccer Coaches poll, including receiving a pair of first-place votes. Akron also garnered No. 2 ratings by College Soccer News and TopDrawerSoccer.com. The Zips will have high hopes for 2019 as Akron is set to return eight starters from a squad that capped the campaign with a 15-7-2 mark and advanced to the College Cup for the sixth time in program history. Former NFL quarterback and Ohio native Tom Arth has been named the Zips’ head football coach, pending approval by the Board of Trustees. The hiring comes after UA announced on Dec. 2 that Terry Bowden would not return to lead the Zips football program in 2019. Mitchell joins UA after six seasons at Walsh University. She pioneered its program, guiding Walsh to more than 35 wins with players from seven different states. 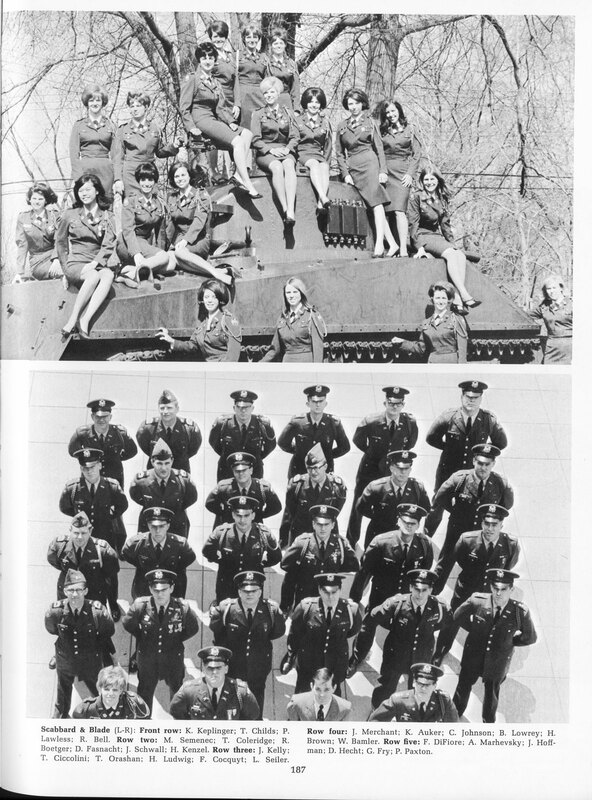 As seen in this page from UA’s 1963 yearbook, The Tel-Buch, women were able to hold auxiliary roles in Akron ROTC. It wasn’t until 1970 when women were allowed to fully participate in Akron ROTC. 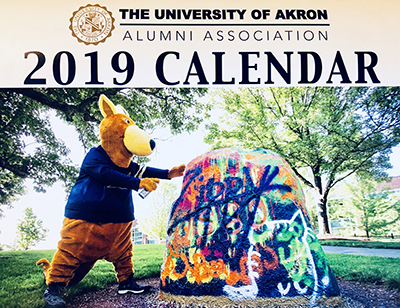 The Alumni Association is launching its first annual Zippy Calendar for the 2019 year! The calendar features everyone's favorite mascot in her favorite areas of the UA campus, and around town. From Zippy and the Wingfoot Three, (a member of the Goodyear blimp family) to joining the Women’s Swimming and Diving team, the calendar is a must-have for any fan of Zippy! Best of all, proceeds benefit scholarships for UA students. Calendars are $20.19 and can be purchased online or by calling the Alumni Office at 330-972-7270. Support from PNC will help Thomas Hall and UA continue to provide quality fine arts programming to students and the community and will enhance PNC’s presence on campus as our official financial services provider. The two ceremonies, delivered by Interim President John C. Green on Dec. 15, celebrated a total of 1,150 degree candidates from 16 states and 19 countries. This group includes 57 candidates for doctorate degrees, 31 for Juris Doctor degrees, 176 for master’s degrees, 766 for bachelor’s degrees, and 120 candidates for associate degrees. These graduates join more than 177,000 UA alumni worldwide!